A prescribed small burn in East Vail will help improve the grazing habitat for the small herd of bighorn sheep. 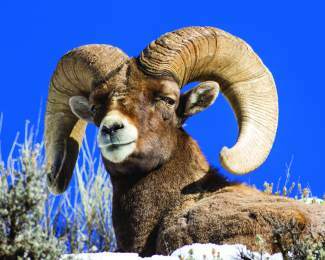 EAGLE COUNTY — The state animal for Colorado is the Rocky Mountain bighorn sheep (Ovis canadensis). This magnificent animal was first described by Francisco Vasquez de Coronado, a Spanish explorer during his travels in New Mexico from 1540 and 1542. Today, Colorado is home to the largest population of the species anywhere. Bighorn are called goats by some, but they are easy to distinguish from the Rocky Mountain Goat. Sheep are varying shades of gray-brown to brown all over, including hooves and horns. Their rump, underbelly, and the backs of their legs are a pale gray. Goats on the other hand are white all over and have black hooves and horns. Bighorns are smaller than they appear and many expect them to be larger. Rams (males) may weigh 150-250 pounds while the ewes (females) are only 120-200 pounds. Rams are about 3 feet high at the shoulder and ewes a little smaller. Bighorns get their name from their massive horns. The horns of ewes are less impressive and have a spike-like shape. Horn is made of keratin, a material found in fingernails. Horns develop around a bony core on the skull and stay with the animal throughout their lives. They continue to grow in diameter and length as the animal ages. The only exception to that are the antlers of the pronghorn antelope that are shed annually. Antlers are made of bone and therefore, are shed annually. It is often possible to gain a general age of the animal by examining the number of annular rings in their horns. Every 3 to 4 inches along the horn a major ring can be seen that developed during the winter. On older rams, the tips of the horn are often splintered or broomed causing the first six months to a year and a half to be lost. Bighorns can live 10 to 12 years. Bighorn sheep prefer hillsides dominated by grass and low shrubs. As herbivores, bighorn sheep feed on grass, leaves, herbs and twigs. They swallow their food without much chewing. At a later time in the day they bed down, regurgitate the food and chew it thoroughly before swallowing it again. Bighorn are almost always found near some kind of rocky, precipitous terrain where they can escape from predators. Since their safety is based on their ability to navigate rocky terrain, they tend to be active during the day. They have an incredible sense of balance and can scamper across what may appear to be vertical cliffs where little footing can be found. Running around on cliffs at night would not be a good idea. And no, they do not have suction cups in their hooves. Their hooves are hard on the outside and soft on the inside which helps with their traction. For most of the year, bighorn sheep travel in two groups. The mature rams stay together in one group. The ewes, lambs and 2-3-year-old rams form a second group. From mid-November through late December and occasionally in the spring the two groups come back together. The rut occurs in November and December and the rams often battle each other for dominance. They face each other at some distance and on an unknown cue rise up on their hind legs take a few steps toward each other and smash their horns together at nearly 20 mph. The sound is unforgettable. Battles can last all day. After mating with a ewe, the gestation period is five to six months and the lambs are born in the spring or early summer. Twins are very unusual. Lambs can climb and keep up with their mothers when they are only a day old. The Colorado State website says that the bighorn was designated the official state animal of Colorado in 1961 because “it is found only in the Rockies, usually above timberline in rugged mountainous areas.” Not really true. I have seen many more sheep below tree line and in less than rugged terrain. There are also a significant number of animals in Western Colorado in the high desert and canyonlands as well as on the plains of South Eastern Colorado. The bighorn sheep is also the mammalian symbol of Colorado Parks and Wildlife. If you want to find bighorns around Eagle County there are many places that harbor sheep close by. One group can be found in the winter on the warmer south-facing slopes near East Vail. There is a large band in Glenwood Canyon that can be found from No Name west to the Glenwood Hot Springs. There is a group near the town of Burns on the Colorado River Road. Another group can be seen on highway 24 between Granite and Buena Vista, along the old railroad. Finally, another group is in the Crystal River Canyon South of Carbondale. Some are seen on the East side of Independence Pass above twin lakes. One group often mingles with the Rocky Mountain Goats on Mount Evans. Driving to Denver on I-70, I almost always see sheep in the area from Silver Plume to the Twin Tunnels. Rick Spitzer is the author of Colorado Mountain Passes, published by Westcliffe Publishers and available at the Bookworm, City Market, Amazon and many stores across the state. The book provides photos and text about the history, lore, wildlife and scenery around the passes of Colorado.